Itching to discover your city’s events? Here are the Apps for it. On every weekend that turns out to be boring, we wish there could be more to entertainment beyond partying & cinema. On every shopping adventure that starts & ends at a mall, we wish there could be some quirkier stores that could take the shopping experience to a high. On every trip to any other city, we wish there were some local experiences that we could soak in. On every moment of boredom, we wish we could just discover our city better! If you are one of those who often feel missing out on city events, or are itching out to explore the un-explored & unknown facets of your city, then we have discovered the perfect apps for you. Presently only for the city of Bengaluru, Townista is an Android app that hosts a curated list of events happening in the city. What we loved about this app was its recommended list – right from the quirky stores, to the list of distinctive temples & must visit cafes, we just loved the curated content in this list. As a tourist in Bangalore, the recommended lists of Townista has the potential of slicing the perfect piece of experience for any of us. As a resident, the app brings out the best in events, be it a musical concert, theatrical performance or any other big event of significance happening around in the city. 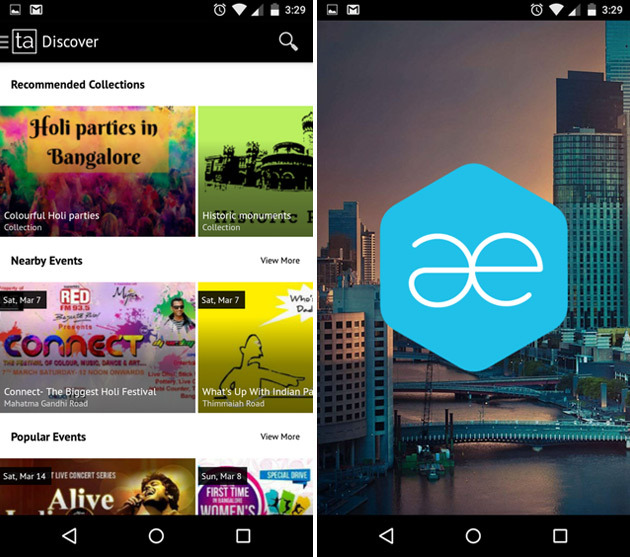 The app we felt was nice, warm enough to make anyone love the city & experience that Bangalore is. The only hitch with the app is that the users would run out of options pretty soon. The recommended list needs to be lot bigger with more diverse experiences mentioned in it. Overall, we loved the app for its simplicity and authenticity. It’s recommended list, we felt, are a lot better than the ones we could find on travel portals such as Trip Advisor. Team Townista – Hope you are curating more content for Bangalore and hope you can start operations in other Indian cities soon! Best wishes! This one’s is a completely different concept all together. All Events is a technology platform to create & manage your event online. So if you are a restaurant, a hotel, an event company, a college or anyone else, all you have to do is add details of your event on this platform. Once an event is created, it can be shared socially on Facebook by people. Those interested in attending any event will also be able to vote a ‘Yes’ or a ‘May be’ on the event. What we did like about All Events is that it allows everybody to create an event. The app hosts data for more than 23000 cities across the world. So the app is nice for the globe trotter who doesn’t need to download different event apps for each city she goes to. On the flip side, the content is not curated and hence there could soon be a time, when there’s just too many an events that it becomes difficult to sift through them or spot the ones we did like to attend. So, the next time you have a long weekend or you suspect the prospect of getting bored, don’t waste anytime to download the two apps!